>_> You know what? I liked you better in "The Fox and the Hound". Don't you have some dog to play with? >_> Just like you, Orihateful. Soon as I threaten to leave you in that cell you get aaaaaall sorry about hurting my feelings. <_< And take that damn signature off. Put on some clothes. And don't you have to go and practice your "It's morphin' time!" Shikai command? By the way, I recommend filing down the tusks on your hollow mask once they grow in. >_> I recomment testing your doggie door before you try to run through it again. Might have a trap set up above it, or just be nailed shut. >_> Cause you ARE mean Injustue. You and Balto up there keep hating on me. ._. Lol...that was so lame, Ichihowcouldyou? ...-Then I kick him in the shin.- <_<; JUST STOP. ENOUGH ALREADY! >_> With this acursed seal...I will rescue you. Even if I have to eat from the fruit of the devil himself...I will attain that power! OMG, SAWSKAY. D: YOU'RE KILLING ME NOW. >_> Not yet I'm not, but soon I may be doing just that. Oooh, Sharingan? Is that a newly obtained power from your mastodon hollow mask? P.S I am not Balto, Balto = Failzorz. 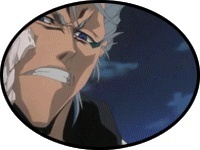 I am Komamura, Komamura = Awesome, Though PWNed by Aizen so fast. >_> I know you turned down "over the hedge" to be in this series, but this doesn't give you the right to "rain" on my "parade" so to speak.